It's really why he's been SOUND till now. Look at that toe! This is the right front, the surgical foot -- the outside aspect of the hoof is on your right when you're looking at this photo. how his white line has improved. I'm very happy with his right front in the sense that his white line damage has grown out, and he actually kept his shoe on for FIVE weeks, which is a record for 2011.
that darned hole. It looks huge now, but when he was being reshod every 3-4 weeks it was much smaller. Ri grows a ton of toe, and the hole lengthens/stretches as the toe grows out. The longer he goes without shoeing, the worse the toehole is. Ri-Ri now has new shoes, with rim pads, that I'll be trying this weekend. I should have photographed that, but forgot. I have a head cold now and will likely let him percolate with the new shoes for a few days till I feel better, and to give him time to adjust. Is that toe hole supposed to ever fill in? I had no idea he still had that much of one! I hope the new shoes are really going to help. And good job on getting rid of the white line. Ugh, best of luck! That looks like an exercise in patience. Sending healing vibes! I've been following Riley's feet "adventures" with interest as my horse has had numerous issues himself. We got to the bottom of it going barefoot although I am not suggesting this could work with Riley as have no idea. However, on the last photo you posted it looks like his heels are very contracted. Probably the best resource for hoof related knowledge I have come across for a long time. Hope you and your vet get to the bottom of the problem. RiRi and TuckTuck could be twins footwise. Tuck grows that toe out as well and we pay for it with similar issues...and his somewhat club feet--one that had the surgery to correct the contracted tendon add to my woes which include keeping the darn shoes on. Tuck also has a short back so he is much more likely to step on the heels of his front shoes. And, as noted, I have tried barefoot several times and it just didn't work. So, all around, my sympathy. Love all of him except for those darn feet. That's quite a hole, but what I noticed first is what an odd shaped hoof he has! Are all four the same or is the strange frog/heel shape due to the surgical history of this hoof? I am reading Feet First right now! It is a wealth of knowledge and photos. A silly question but what's wrong with his heels and frog? Re heels and frog: the heels are contracted which might mean he doesn't use the back of the hoof as he should i.e. might not be landing heel first but perhaps flat or toe first. Well, yep, the barefoot hoof is always going to look different. The problem is, Riley at age three was barefoot when his hoof "self-destructed" for unknown reasons. From a yearling on, he abscessed every three-four months until he was shod, and not once since then. I tried to keep him barefoot behind, and even being ridden strictly in an indoor with beautiful footing both heels of both hinds abscessed. And not once since being shod. The vets I have seen all agree that HE NEEDS SHOES. I totally get that barefoot has distinct advantages, but it is not right for every horse. I would love for Riley to not need shoes. But it's just not the way it is. Sorry I didn't mean to suggest you should be taking him barefoot. It just easier to demonstrate the healthy foot in a barefoot horse. Perhaps it's his diet or mineral content? Rockley Farm that rehabbed my horse suggests diet is the most important factor in hoofcare. All the best for Riley. Ditto on the toe hole - does it stay that way forever? Best of luck with his feet. For what its worth from the peanut gallery of the internet, it looks like his toe is running forward a bit and his heels are contracting. This observation is from looking at the bottom of the foot, and the solution would be in the pre-shoe trim of the foot. ELPO has some nice videos on recognizing hoof distortion. ps- in my experience horses who grow a lot of toe often do not have adequate frog/heel pressure which will mean contracted heels because their hoof does not have the circulation and pressure to expand and contract normally which leads to contraction and lack of growth. Others have put more educated comments, but to my eye that hoof is a perfect oval shape. Straighten the photo up and draw an oval over the top, you'll see how neat it fits. 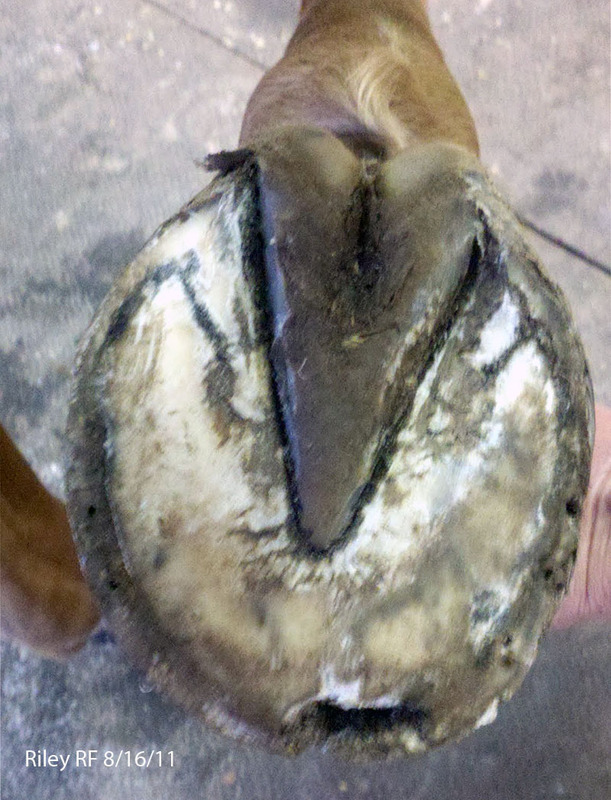 A healthy hoof should have more width at the heel area, a bit like an apple. He's doesn't have much weight bearing surface at the back of his hoof so it would stand to reason he has some heel pain. I don't envy you trying to deal with such a recalcitrant hoof!